Home > Blog > Gardening > Bugs & Pests > What critter is this? This evening I’ve found another creature – it looks like a baby – and newbie-gardener that I am, I have no idea whether to leave it or remove it. Please help! Is it a grasshopper? It doesn’t look like a praying mantis to me, too fat. And I’ve noticed over the last few days that something is “eating” tiny holes in these flowers (sweet williams). I’d appreciate any help in identifying this little guy (total size is +/- 1.2 cm). PS: Yes I know, I need a Macro lens … working on it! You can look into “extension tubes” too — they’ll give a regular lens macro capabilities. Might be cheaper than getting a macro. Hi Alan – I’ll look into it – but my Daughter has promised me a macro lens . I’m waiting patienly … (Its her fabulous camera I use most of the time – the camera “lives” here at my home which is lucky for me). Not sure what the critter is but that is a beautiful picture! Hey, I think this is what’s chomping on your blommies!!! It is either a immature grasshopper or a Katydid (I think that is how you spell it!) 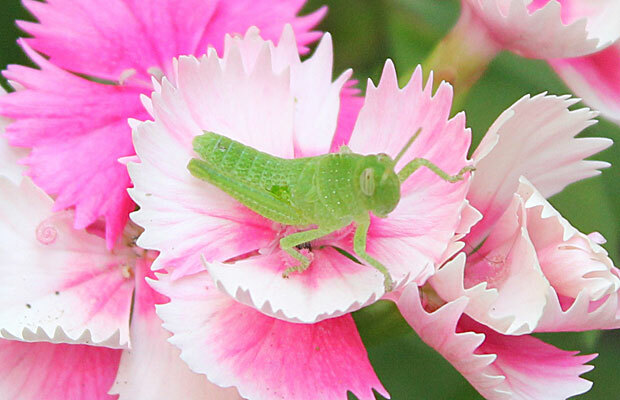 I just had a look on google and it is indeed a grasshopper nymph. So I would get rid of it or let Mr Mantis have him for lunch!! He is a little bitty grasshopper. They start green. If you have birds in your garden he’ll likely be Lunch soon. Do you know how hard it is to click on a link that says “What critter is this” when you know you guys live in the spider capital of the world! Whew, I think the is a nymph stage grasshopper. But this is a complete guess based on not expertise in the field. Just glad I saw 6 legs.